Is your group seeking event facilities near Lake Michigan for your next meeting or gathering? 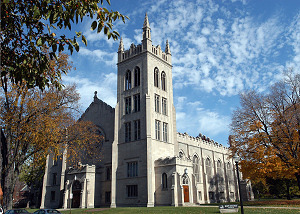 The greystone architecture of Hope College in downtown Holland, Michigan welcomes you and your guests with the warm promise of a memorable event. Just 25 miles from Grand Rapids, 3 hours from Detroit and a bit over 2 hours from Chicago, this picturesque campus is centrally located for guests arriving from anywhere in the region or the nation. Able to host as many as 3000 attendees, (up to 1000 overnight guests on campus, plus hotels within walking distance) this charming campus provides the unique opportunity for events both large and small to enjoy small-town hospitality and openness in big-city numbers. Of course, groups of any size are very welcome at Hope College! The Maas Auditorium provides picturesque views under a high ceiling, its 3500 square feet making for a very pleasant and spacious indoor meeting room. The massive DeVos Arena makes an ideal concert or sporting event venue, with 102,000 square feet! You'll find exactly what you want, no matter what your needs may be. There's even the Knickerbocker Theatre on Main Street, for style and nostalgia. Catering services are available, of course, as well as formal seated dining. Everything from casual snack service to the elegance of the Haworth Inn's ballroom is available to you and your guests. Some may prefer to take a leisurely stroll down Main Street, enjoy browsing the string of over 120 shops, and pick up a bite to eat along the way. Whether you just need coffee service, or look forward to a white glove affair, you can count on Hope College to ensure that you and your guests enjoy the stay! Of course, technology is state-of-the-arts. Broadband and WiFi are both available, as are other A/V technologies, presentation equipment and conference calling, to bring invitees in with you. Be sure to get the WEP code for WiFi access. Hope is truly one of the top meeting and banquet facilities in Michigan. Hope College delivers on its promise, providing you with a unique venue, an outstanding place to hold your next special event. Find out for yourself just how splendid the campus is. Give them a call, let their conference center staff provide you with a quite on the experience of a lifetime!